Once again, the questions come in from investors being introduced to RadioActive Trading about trade entry. We run comparisons every few months based on customer feedback and new trading ideas for limiting risk – and every few months we feel more confident that the Married Put structure used at RadioActive Trading is the best way to go. “…instead of buying immediately the combo “Stock + Protective put”, could we not sell a put OTM at let’s say a 0.3 delta for instance. If the put is assigned at expiration, the initial credit received will paid a part of the protective put. Every new RadioActive Trade we open is entered as buying stock and buying a far out in time, put option to control risk. But as options traders we know that we can ‘Potentially get into a stock at a Discount’ by selling Naked Puts. When we sell a put we enter an obligation to buy shares of stock, if the stock is trading below our sold put strike price at expiration. We receive a premium up front, and have the opportunity to buy shares of stock at a lower price. Why pay for the stock up front when you can receive payment for the chance to buy stock later, at a cheaper price? The position has a Bullish sentiment, with a positive upside delta, and carries a worst case scenario of only a 5.6% loss on investment (Only $858 at risk on an investment of $15,358). The stock is trading at about $149.50, up +$10.42 since purchase, or 7.5%. Of course, the put has lost value as well and is currently trading at $9.25. We paid $14.50 for the put, so we do have a loss of -$5.25 on the put. But gained $10.42 on the stock we own. Right now we have an unrealized profit of $5.17 on the stock and put combination, or roughly 3.4% in 30 days. Note that the stock is still well below the ‘Break-Even’ of $153.58 – but we already have a profit. But Couldn’t We Do Better Using Less Capital and Got Into the Stock at a Discount? Well, sure…in a perfect world with the perfect outcome. If I purchased the same DEC 145 put on June 12th, but sold an OTM put to get the stock at a cheaper price, I would have a lower capital requirement. I COULD get into the stock at a cheaper price – if the stock was trading just below the short put strike at expiration. But is the risk lower? Is the position better? The Calendar Put spread requires only $10.95 per contract to enter, vs. $153.58 per share of the Married Put. I am definitely not saying this approach requires less capital to trade. The Maximum Risk of the Calendar Put is the debit, or $10.95. This is $2.37 higher at risk than then Married Put at $8.58. The % at risk? Hey, the Lie of Leverage works both ways. Sure, this leveraged spread has the potential to earn 45.7% of the investment…if and only if the stock is trading right at $135 on 21-JULY expiration. That’s a tough target point (which has already been vastly exceeded). But, you are taking a risk of 100% of what you invest. The Married Put only risks 5.6% in the worst case scenario. Not even close. Oops. This does not look good. With BABA around $149.50, we are entering the loss zone to the upside. As the stock rises, we make less and start to lose money with this approach, where the Married Put is gaining more and more. Sure, you collected $3.55 up front for selling the OTM put. But, that is all you can make if the stock moves up in price. Meanwhile, the DEC put (same as used in the RadioActive Trade) has lost -$5.25. -16.4% of what we invested (3X the Maximum risk on the Married Put – which again is at a profit). Am I Saying That You Should Never Use a Short Put / Calendar Put Spread? Well, kind of, if you truly want to control risk (which is the only thing we can control in the market). Simply selling a Put, called a Naked Put or Cash Secured Put takes on a lot of downside risk. If the stock gaps down you can take large losses to the downside, which will wipe out many previous gains. The Diagonal Calendar Put spread can be a useful strategy – if you are neutral to bearish on a stock. That is the key. When I open a RadioActive Trade I am selecting the stock I feel has the best potential to move up in price in the next 30-45 days, or less. I am not always right…which is why I trade with protection to begin with. Only one of these two strategies carried a High Risk Zone – and we are already there. Would the Calendar Put spread do better if the stock had stayed around $140.00? Of course. But that was not our Expectation for the stock. If I had a bearish sentiment I would consider a Calendar Put spread, a Bear Call Spread, or maybe even just buying a long put. But the structure of the Calendar Put spread did not match my expectations. If the stock only moved up 3-4% as expected, the RadioActive Trade would be at a profit. The Calendar Put spread would be at a small loss. It’s going in the wrong direction for the structure of the trade. Would I ever use a Calendar Put? Of course, in fact that is one of the 12 Income Methods we use at RadioActive Trading – under the right circumstances for the overall trade. But to use this structure if I am expecting the stock to move up? No, it is the wrong structure and can have disastrous leveraged losses. So, Why Would One Consider Doing this in Place of a RadioActive Married Put? To use less capital. If we use less capital the trade must be better, right? Well, we have proved that it is not really the case. We would now be in a low risk Married Put with a better cost basis than buying the stock. BUT…in order for that to happen the stock would need to fall -3%. We would be into the stock at a discounted price, but we would be holding a $145 put on a stock that is trading below $135. Again, that was not our expectation for the position. Because we all want to generate income right away! A blessing and a curse for most options trades. There is nothing wrong with income strategies – unless they go against your original expectation. When you sell premium too soon and at too low of a price, you change the dynamic of the trade. You will likely go against your initial Expectations for the stock…and be in a loss zone rather than a profit zone. Because you HAD to generate premium. Not always the best idea. Because as Options Traders we know we have…Options! Thinking outside the box. Taking what you know, and applying it to better or increase profits on a new strategy. Nothing is wrong with this, in fact, I did this Calendar Put approach with my first 3 RadioActive Trades back in 2007. Guess what? I lost on all 3 where I would have had a profit by simply opening the stock and put combination. Always remember the structure of the trade, and your Expectations for why you selected the trade. Don’t handcuff yourself for the sake of getting premium NOW. Now that we have looked at the structure of the two trades, what are we left with? Well, the Calendar Put as a substitute for the Married put really only works if your Expectations are that the stock will move no more than +1% or -1% in the first 30 days, then will continue to move up several % or more in the following 3-4 months. If you can pick stocks on a consistent basis (65% of the time or more) that move down slightly in the first 20-30 days, then will gain 6-8% or more in the months after that, then this will work. And, you don’t need my help to be successful at trading. But when you are looking for a Bullish trade, and identifying bullish stocks, the protected Married Put position is the way to go. I hear you, and have heard others like you. Check out this archived webinar where we compare the ‘Poor Man’s Married Put’ (ITM Long Strangle) and the Reverse Collar against the RadioActive Married Put Position. Click HERE to view Comparison of Limited Risk Strategies. Do you have another setup you would like to compare? Let me know in the comments! I can continue to sell naked puts each month till december……avaient the long put. No loss here if the stock goes north all the time……. I can continue to sell naked puts each month till december….AGAINST the long put. We did not really forget about that, but you are correct. Let’s say that BABA continues its current chart pattern for the next 6 months to December. In the last 3 months the stock has moved from $110.00 to $150.00 – a $40.00 move, or $13.33 / month on average. Over the next 6 months, that would be a move of $80.00 more, to $230. So let’s say you roll up to a just OTM put after each expiration, collect $3.00 per month for $18.00. The initial put was $14.50, so you have a profit of $3.50, or 24.1% (the DEC 145 put would expire worthless). Remember also that as you are selling puts at the higher prices, you are now in more of a Bull Put spread – so you would have to put up the margin between the higher strike puts ($160, $170, etc). But that is not a big deal, just an observation. 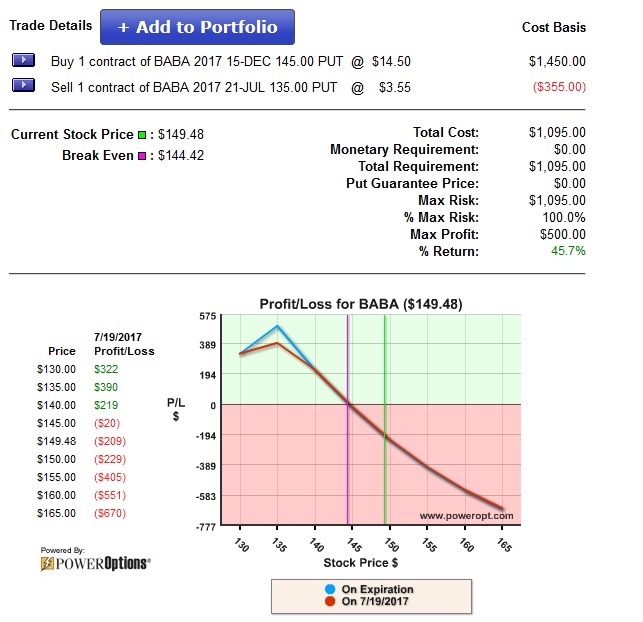 Now, if BABA did go up to $230.00 at DEC expiration, The Married Put would have a profit of $76.42 ($230 – $153.58), or 49.7%…still better monetarily and percentage wise because of the Delta. That is not the true expectation, but you mentioned that if the stock goes North all the time, there would be no loss. Using the Income Methods in The Blueprint we could remove all the risk from the BABA Married Put trade, have a guaranteed profit if the stock pulled back, and still have an unlimited profit to the upside, while generating income. In the first 30 days. I like the RadioActive strategy, but why play it so safe? This was, as explained here, a bullish strategy. So…why was it necessary to buy a put that was so far ITM? How did you determine that a < 6% maximum loss was the way to go? The gain here would have been greater if, for example, you had bought the $135 strike put instead. Yes, the maximum risk probably would have been around 10-11%, but the current gain would be higher and the probability of a profitable trade would have been greater. 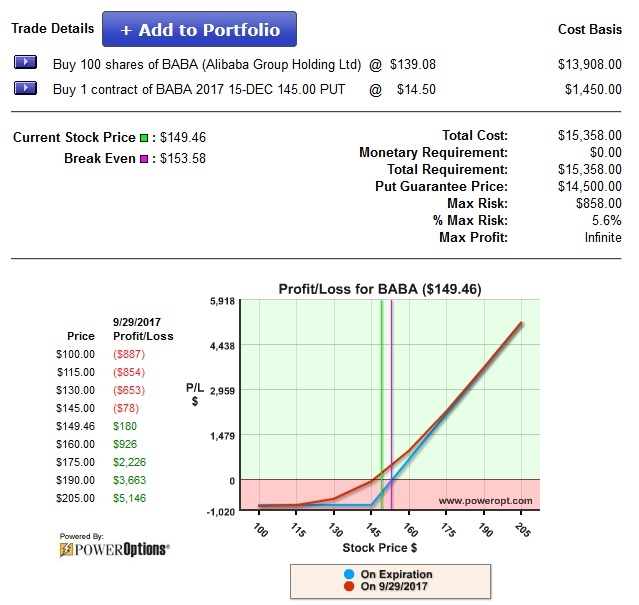 This BABA trade was unusually good as the stock went up 7.5% in only one month. That doesn't usually happen. Hi David, sorry! It appears we had an issue with notifications and I did not see your post until now. The reason this structure is used is because of the Martingale, or Gambler’s Ruin aspect. Yes, a lower priced, OTM near term put would have a lower cost and would result in higher gains if the stock moved up – but the risk would be higher. If I take a -10% loss, I need an 11% gain to get back to break-even. A -25 loss would need a 33% gain to get back to break even, and the slope gets worse and worse. If I take a -5% loss, I only need a 5.3% gain to get back to break-even. Also, you may have seen in other webinars how the ITM put, far out in time, will retain most of its time value (and can actually increase time value or extrinsic value) as the stock moves up. The OTM put will lose most of its value. This means it is harder to make any adjustments on the position with an OTM put that now has a value of $0.05. Regarding your other comment, about 60-65% of my Married Puts move up 5% or so in the first 30 days. This is why we keep the criteria that is set in the RPM Report in Fusion, and in the default Married Put screen on PowerOptions. Thanks for the comment, and I am sorry for the delay in response! “could we not sell a put OTM at let’s say a 0.3 delta for instance. You responded with a “put calendar” explanation which, obviously, is a put spread. But the question only involved selling a put, and if it is OTM at expiration selling another, then another. If being assigned the stock, then we would enter the married put strategy at that time, having collected all the naked put sales premium up to this point. As far as I can see, there was no question about any put spread, only selling a naked put. I think I got it.. From a risk management point of view and by also utilizing the concept of FIST (Force Ideal Sized Trades), I have found that there are times in which a collar would be a better investment choice than a married put. From the point of view of risk management, the amount (percentage) at risk is the most important variable that we can control. Hi James! Mike Chupka here. I agree with you. I do not trade covered calls anymore, and haven’t for over 10 years. If I see an opportunity that looks like a good covered call on PowerOptions, but I do not have a long term outlook, I will typically enter the position as a Standard Collar (less than 45 days out in time). I may convert that to a RadioActive Trade later, but in general I am looking for a shorter term profit. But, even though I have traded standard collars for a long time, the risk reward ratio (looking to make about 2.5% on assignment to a risk of 4.5% or so) dictates that I still need to be right about 65% of the time. Thankfully I have been, so I still trade that strategy. On my RadioActive Trades, the average gain is about 7% and the average loss is about 5%, so I can be wrong more often than right and still make money (although, I am over a 60% win rate and outperforming the Collar portion of my Portfolio). But, yes, in either case, the risk management is most important and the only thing we can control! Is it possibile to create a Bulletproof married put structure substituting the stock with a syntentic stock (-1put ATM +1 call OTM) ? Hello Fernando, although possible we personally do not do it. We have had investors do this in the past, but they abandoned the approach within a few months and went straight back to the proper stock+put combination. The risk-reward profile is similar (P/L chart), but some extra caveats appear depending on your account approval, assignment on the short put, etc. Of course I would never do that approach on a RadioActive Trade where the stock pays a dividend. I will try to revisit this for you in later blogs. ~MikeC. I am beginning in using married put and i find it is so simple and genial at the same time. Usually i build my strategies mounting the legs looking at greeks and Implied Volatility that stocks give me day by day. I get into the market only after having studied a “WHATIF plan” in the case my forecast is wrong. This take me a lot of time and force me use a software for automatic execution of the workflow that i have previously planned. After a lot of test i have not yet find a good B-Plan. The best chess move that i have found is doing nothing accepting the expected loss (2-8%) trusting in gain on other parallel RPM structures. Can you give me please a suggestion for B Plan worst case scenario ? To be prepared for eventual worst case, do you think it is a good idea to start into the market with a syntetic long straddle ( +1 put and 1/2 Stockes lot) and then converting in a full RPM position looking at the market variables ( greeks and IV) ? I do like the married put strategy, but one question I have is : when you place the trade do you also consider IV ranking at the time? Considering IV usually drops when stock goes up, I’m just wondering can you potentially get into a bad trade by starting a married put position when IV is high (e.g. pre earnings). So with the stock goes up (but still below the put strike), that IV implodes so much that your entire position still goes down? If the reverse were to happen when stock goes down, it’s not as clear to me what will happen. The IV will likely explodes, but the put will become a lower delta (e.g. from -.0.75 to -0.9). Seems like these two even will cancel each other out. In this case do you look at gamma to determine how will the extrinsic value change? Fernando, your first plan is probably the best. This is a bullish trade so the best thing is to take this trade off, your synthetic straddle would leave you with fewer and fewer deltas as the stock moves up which isn’t what you are trying to accomplish. As for the synthetic idea, I agree with 99% of the concepts presented here. People get hung up on margin on trades vs. risk. If you are truly managing your portfolio you will be worrying about your risk on trades long before you have to worry about the margin. Besides, long stock neutralizes all the greeks giving you 100 true deltas and no matter what the vehicle the bid ask will always be tighter on stock compared to call options. The only 1% I differ is for people that have a portfolio margin account. I trade a lot of synthetic positions (long call /short put or opposite) and with PM you are margined on risk. I AM NOT RECOMMENDING OVERLEVERAGING. However, if you start with a synthetic stock and long put with 3% portfolio risk (or whatever your tolerance is) when get the position bulletproofed you can use the freed up risk to open another position. The difference being you get a credit for the synthetic vs having to pay margin for the long stock. Due to arb opportunities the spread is just as tight as the stock position (talking pennies) and if you do get exercised early on the short put you are long the stock with the ability to close out the long call for any value left. Dividends are priced in to the options so not an issue and really most higher dividend stocks aren’t the best RPM candidates. Just an opinion, been trading this concept for many years. I also trade some pretty complex strategies in my portfolio but I still allocate a big chunk of my risk $’s to this one.